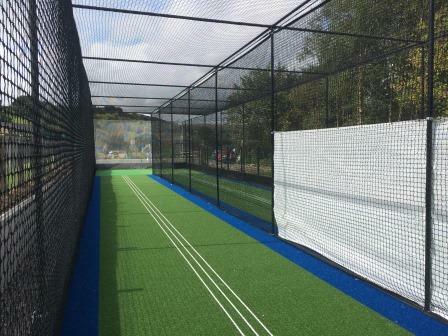 When Halifax Cricket League side Oxenhope CC looked into investing in new synthetic cricket practice nets at its village ground near Keighley, due to minimal space on site it became evident that additional land was required to enable construction. 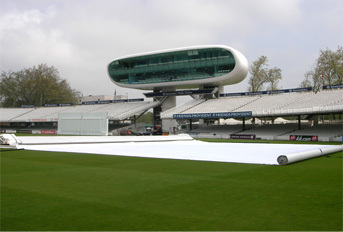 The club purchased land adjacent to the ground after three years of negotiation – however, the project was not to be plain sailing. 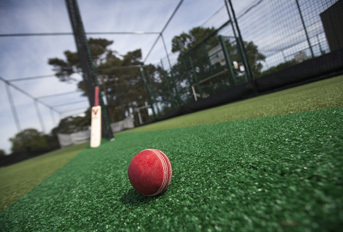 The club applied and was subsequently rejected for Sport England funding but, led by club Chair Derrick Hopkinson, launched an in-house fundraising campaign to generate capital. A significant sum was raised through club efforts, with the club then applying successfully for an ECB loan to make up the remainder of the required funds. 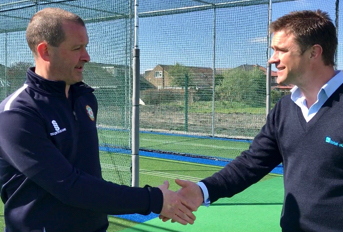 With the funding secured, the next stage involved the selection of a supplier from a shortlist of companies providing ECB approved non-turf facilities. Significant research was carried out before total-play was awarded the contract, with the team’s in-depth knowledge, quality of product and fair quote highlighted as key factors in its appointment. At construction stage came another new challenge. The newly procured land on which the facility was to be constructed was not only overgrown with unmanaged established trees and self-seeded shrubs, but the run off from the adjacent cricket fields drained into the area. The gradients on the plot were also well outside those acceptable to build a practice facility. 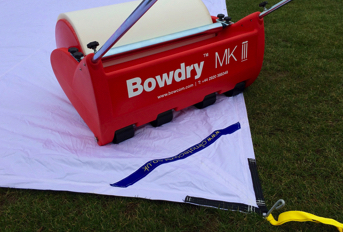 To remedy these issues, total-play worked closely with the club’s local groundwork contractor to specify a programme of clearance and levelling. 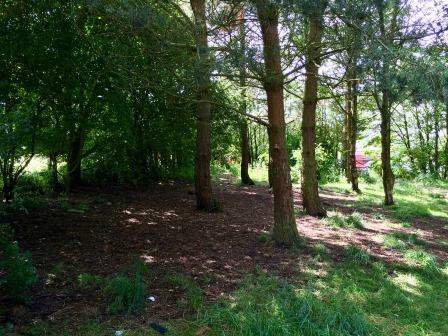 This involved the removal of all trees, shrubs, associated root mass and organic material before the gradients – as much as 1.5m over the length of the area – were graded out. During this phase of works, catchment drains were installed to protect the base of the system from the main pitch run off, connected into new purpose-built soakaways. 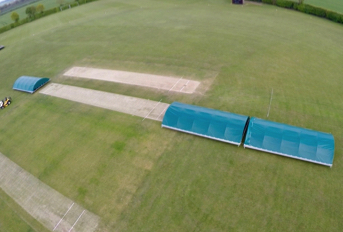 The exposed boundary edge was retained with a concrete sleeper wall and the whole area consolidated and graded to the required tolerance for building the new ECB approved practice facility. With total-play then taking the reins on site, the specification for the system itself was adapted to include a deeper than normal base aggregate profile. This raised the system above the formation layer and surrounding ground and was finished with a concrete kerb perimeter to offer increased drainage capacity, longevity and performance. On top of this bespoke foundation, total-play then installed a 2 lane, 33m facility to its ECB approved tp365 system design. 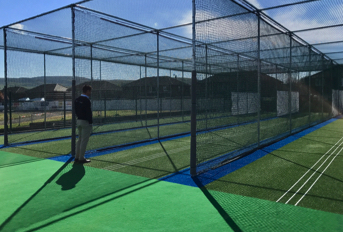 Finishing touches to the facility included black powder coated steelwork, batting curtains, training lines added to the full width woven playing surface carpets, HD Protection Tunnel netting, a 2m high security fence and access steps down to the facility from the outfield. A stretch of carpet was also laid in front of the pavilion to help keep this high-traffic area clean and tidy. “We’ve known David Bates from the circuit for a number of years, so had full confidence that his expertise would deliver a first-class facility. When at quotation stage the total-play proposal was among the most competitive on the table, our decision was pretty much made.